The recipient of the 2014 Jack Ferguson Award, Jakob Chychrun, has agreed to terms with the Sarnia Sting Hockey Club and will join the team for the 2014-15 regular season. Director of Hockey Operations, Bill Abercrombie, is pleased to announce that standout defenseman, Jakob Chychrun has agreed to terms on a standard player agreement and education package with the Sarnia Sting Hockey Club. Selected first overall by the Sting in the 2014 OHL Priority Selection, Chychrun is a 6’2”, 195 lb. defenseman who led all GTHL defenseman in goals (16), assists (27) and points (43) through 29 games with the Toronto Jr. Canadiens last season. Last season Chychrun was named to Team Ontario’s U17 program as an underage skater; the first non-exceptional status player ever to do so. He recorded 4 points in 5 games in the tournament. Director of Hockey Operations Bill Abercrombie maintains that Chychrun will be a great addition to the Hockey Club. 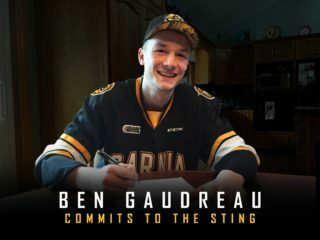 The Boca Raton, Florida native has elected to agree to terms with the Sting and is thrilled to be given the opportunity to prove himself as a player in the Ontario Hockey League. 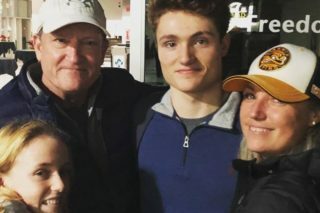 Chychrun and several other Sting prospects will make their debut at Orientation Camp throughout the June 7/8 weekend at the RBC Centre in Sarnia. Black & White Scrimmage #1 – RBC Centre Rink 1 Saturday, June 7th @ 2:30 p.m.
2014 Draft Pick introductions – Hive Bar & Grill Saturday, June 7th @ 5:00 p.m.
Black & White Scrimmage #2 – RBC Centre Rink 1 Sunday, June 8th @ 10:00 a.m.